One of our most popular YouTube videos is of Tara and I riding and bathing an elephant at Elephant Junction in Thekkady, India. The whole experience was extremely memorable, and it was just a puzzle piece in our month-long exploration of the southwestern Indian state of Kerala. It ended up being one of our favorite regions we visited during the two and a half months we traveled around the country. Tara and Bina share a bath together. Most tourists who visit Kerala choose to sightsee in four cities: Kochi, Alleppey, Thekkady, and Munnar. These are the region’s golden circle of must-visit cities for those visiting the area. We ended up visiting three of the four, skipping out on Munnar simply because it offered mainly the same activities as Thekkady but with higher accommodation costs. Tara and I started our month-plus visit to Kerala in Kochi. More specifically, we spent about a week relaxing north of Kochi at a remote homestay on Kuzhupilly Beach. We spent our days reading, writing, jogging along the beach and enjoying each other’s company. It was a period of relaxation after a month of quick travel through the north. After Kuzhupilly, we stayed in Kochi for a few days to sort out our remaining time in Kerala. Then, at the suggestion of Mayank, an Indian guide, we traveled via bus to Alleppey, another amazing city in Kerala that is known for its backwaters and houseboats. First, we stayed in a homestay in a village where we took a cooking lesson with the owner’s wife. While there, Tara had her backpack ransacked by ants in search of her not-tightly-closed jar of peanut butter. We decided to move. Not because of the ant experience, but because we weren’t within walking distance to the main part of town. We moved to a hostel-type place called Lake and Paddy that only had private rooms and bungalows. True to its name, it was situated in a village about a mile from town between a rice paddy and a waterway extending from a nearby lake. Here, we relaxed once more, enjoying sunrises on the waterway and sunsets over the rice field. Tara got hooked on tomato fry at a local restaurant, and I couldn’t stop eating thali, a lunchtime meal that includes unlimited rice, papad, raita, curries, and vegetables. We also went on an amazing half-day kayaking adventure and learned about village life on the backwaters. From Alleppey, we headed to the small, mountainous town of Kumily, which is adjacent to Thekkady and where the bus station and many hotels are located. The cost of this hours-long ride from Alleppey was 25 rupees each, or less than 50¢ USD person. Even though the price of transportation is attractive, the actual journey was not. The long and arduous bus ride left our ribs bruised from continuously hitting the metal arm bar as the driver flew at high speeds on twisting, bumpy roads. Our main motivation for visiting Kumily was to get up close and personal with elephants and to explore Periyar Wildlife Reserve. We had heard there were different tours that gave visitors a great chance to see elephants in the wild (something we had experienced many times months earlier in Africa, but we eager to do again with the far less-aggressive Asian species). Colorful Rainbow Cottage in Kumily – it’s hard to miss it! After browsing Kerala’s homestay directory, we opted to stay at Rainbow Cottage in Kumily, which is walking distance from Thekkady. We had been using the homestay directory because it showcased accommodations with generally better prices than hostel and hotel booking sites. Since we had a cell phone with an Indian SIM card, we just went down the directory’s list calling for availability and pricing. We ended up having a great experience (and delicious food) at Rainbow Cottage due to the property’s owner, Mohamed, who runs the four-story hotel with his family. From the first time I spoke with him on the telephone, I could sense his desire to show his guests a good time. We were given a spacious and bright room that was probably one of the nicest hotel rooms we stayed in up to that point in our trip. There was even a “patio area” outside every room with a couch and coffee table (The view from our room). Rainbow Cottage itself was a one-stop shop for everything in the area. 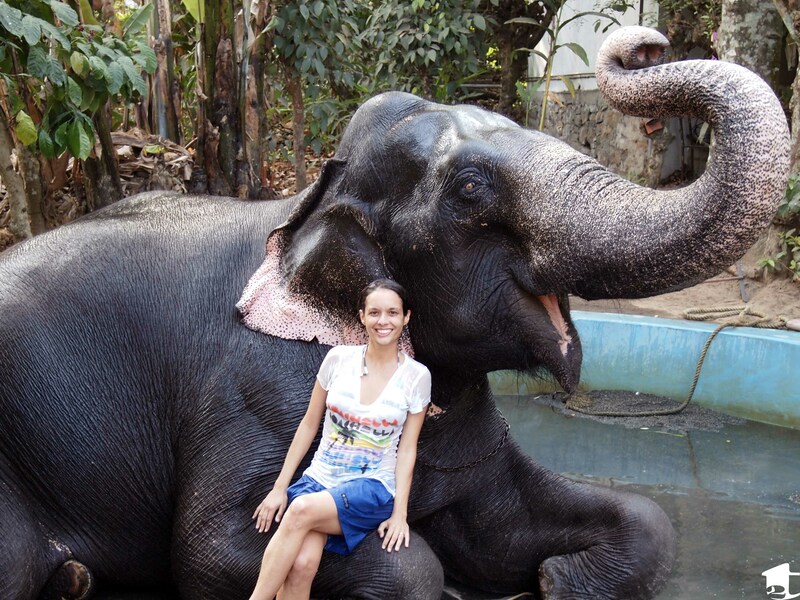 We booked massages, a spice plantation tour, a Periyar tour, and the elephant experience through the property. They also served tasty breakfast, lunch, and dinner at their rooftop restaurant, which offered a great view of the small but bustling town. The hotel was walking distance from everything we wanted to do, and we always felt safe walking around during the day and night. Tara and I were enjoying our stay so much that we ended up extending our time there. Everything about the area just exuded a calming aura that, after nearly 2 months of travel within India, we had only experienced in Dharamshala in the Himalayas. Initially, we only were going to stay for 2-3 nights, but that soon turned into 5, and finally 10 days and 9 nights. Since we kept extending our stay, Mohamed upgraded us to an even bigger (and recently finished) room and gave us a discount that lowered the rate to 750 rupees per night (less than $14 USD per night). Besides eating at Rainbow Cottage’s restaurant, we became regulars at Haven, another hotel restaurant in town. We often had filling meals that included drinks, a starter and two entrées for a total bill that was less than 200-300 rupees, or $4-6 USD. Because the prices at both places were so reasonable, and we found ourselves literally going down the menu ordering every vegetarian and fish dish available. The local specialty of fish with tapioca was one of our favorite dishes in all of India. Periyar Lake inside Periyar National Park, India. 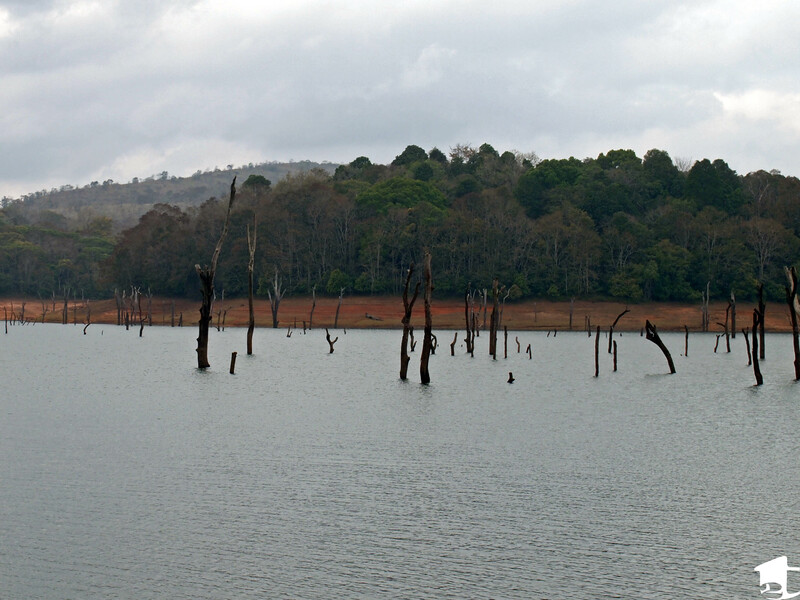 A couple days into our stay, we took a trekking and bamboo raft tour of Periyar Wildlife Reserve. It was a full-day tour, starting at 8am and lasting until 6pm. 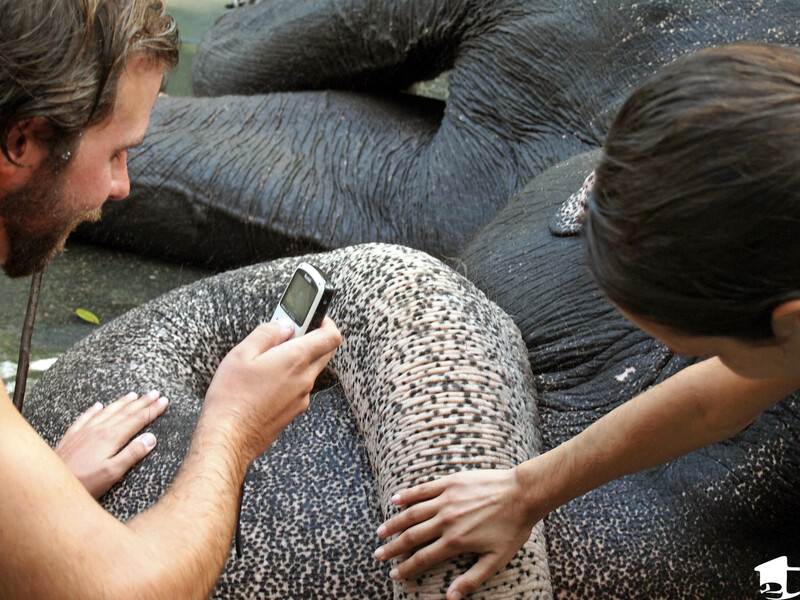 It was presented to us as an opportunity to see elephants, tigers and various other animals. The sad fact is that most of the park’s animals have been hunted to elimination. During the 10 hours we walked and paddled through the park, we saw probably only 5-10 animals, including an elephant family of four that we stumbled upon, but a nice variety of birds. Tara and I have been party to enough game drives/walks to understand that seeing animals in the wild is hit or miss, as nature does not always cooperate with the scheduled times of tours, but our guides admitted that most of the animals had been killed for food by locals. It was a foreign concept to us—locals sneaking into a national park like America’s Yellowstone or Yosemite and poaching to create an income. It’s something I could not (and still can’t) wrap my head around. Here we were in one of India’s premiere national parks and it eerily resembled a graveyard. This similarity extends to the landscape. For part of the tour, we paddled a 10-person bamboo raft through Periyar Lake. The lake is beautiful, but also somewhat unsettling. Dead trees poke out of the surface like skeletal remains of a forest (Which indeed they once were. The lake was man-made, the valley flooded to create the body of water.). With the ecology and food chain out of balance, it is easy to understand why tigers have started to poach men for food. During our tour, we were accompanied by a guide with a rifle and instructed to stay close to avoid any mishaps. The cost of the tour felt high at 1,800 rupees, or $33 USD per person, but perhaps our opinions would have been different if we had encountered more animals. Overall, the experience left us wanting more, and when we found out there was an elephant park nearby, we didn’t think twice about gong to visit. The park was in Thekkady and less than a mile from Rainbow Cottage, so we walked over one day to find probably 8-10 elephants wandering the premises. In most cases, they had handlers guiding them around as they gave rides to tourists, but a few were leisurely eating palm leaves or drinking from a water hose. Immediately, we knew this was going to be a memorable experience. They offered a couple options that varied in price according to how long you would interact with the elephants, but we opted for an hour-long package that hovered around 1,000 rupees, or $18 USD, per person and included an elephant ride that brought you through a spice plantation and the opportunity to scrub and bathe one of the gentle elephants. It is difficult to describe the difference between seeing animals in the wild and in a zoo. It is even more difficult to describe the difference between watching an animal and being able to reach out and touch them. While we rode Bina, a 25-year old female, I scratched her head. Her skin felt so thick that I wondered if she could even feel my touch, but after a minute she moaned approvingly. As we rode around the spice plantation, the guide pointed out coffee beans, pepper vines and more, but I was transfixed with Bina. The hair follicles on her scalp may not have been many, but they seemed so thick, like giant blades of grass protruding from an anthill. I kept examining her, as if this opportunity might never come again. After dismounting her when the half-hour ride was over, we moved to a large wading pool to bathe her. Mike and Tara scrub Bina the elephant for her bath. The elephants are used to getting bathes throughout the hot day, so Bina was comfortable with her guide directing us how to scrub her. There were an array of brushes in the pool and a garden hose spraying cool water. Tara and I got more than a little bit of water up our noses as Bina playfully shot water at us through her trunk. The whole bathing experience probably lasted 20 minutes, but it felt like forever (in a good way). It seems weird now talking about how giving an elephant a bath was one of the most memorable things we did during our trip, but it was. Being able to touch an elephant without fear or seeing fear in their eyes made the interaction magical. If you ever have the opportunity to do something like this, I highly recommend it. On a whole, Kumily might seem slightly off the beaten path depending on the route you may be taking in India, but it is well worth your time. We filled the rest of our time in town with other activities that made the days seem to blow by, like a tea and spice plantation tour and Ayurvedic massages (my particular massage was such an incredibly NSFW experience, that I may or may not write it up). The people we met were so friendly and welcoming, and for a brief moment, we thought about staying longer. But after 10 days of mountain air in Kumily, we had to head back to the coastal city of Kochi to catch our flight to Singapore. We had to leave our little mountain paradise, but we wouldn’t mind returning one day. The music I used for the elephant video was created by Kevin MacLeod, “All This.” If you are ever wondering, check the Youtube video’s description, the majority of my Youtube videos use music licensed under Creative Commons Attribution 3.0 ( http://creativecommons.org/licenses/by/3.0/us/) and must credit the composer. Besides Kevin’s compositions (which can be found here: http://incompetech.com/), I also love to work with Dan O’Connor’s songs ( http://www.danosongs.com/). I am always looking for new musicians to collaborate with.